Residents of Virginia Beach, take warning. Hurricane Joaquin is now a dangerous Category 4 storm over the Bahamas and while new weather data suggests that the storm is moving out to sea rather than toward the U.S. inland, areas on the southeast coast will still experience heavy rain, storm surges, as well as flooding. Hurricane conditions are expected to continue in portions of the central and southeastern Bahamas through Friday and a very dangerous and life-threatening storm surge will raise water levels by as much as 5 to 10 feet above normal tide levels in the central Bahamas. Elevated water levels are likely to cause life-threatening surf and rip current conditions. The Virginia Red Cross is your go-to resource for all things emergency and disaster relief related in your area. They’ve got resources to plan & prepare for a disaster, including information for children. You should also have a disaster survival kit created in case of an emergency like a hurricane. Include non-perishable food, bottled water, flashlights, batteries, candles, and a first aid kit. Don’t forget to grab important emergency contact information and insurance documents, as well as any medications. Secure both personal possessions as well as the home itself. Move furniture, valuables, and important documents to a higher level in your home, such as the second floor. For safety purposes, shut off the main power supply, unplug electronics, and move hazardous materials to higher ground. Also, secure any outdoor items or furniture that may be picked up by high winds. If you have a mobile home, make sure it is anchored. In addition to protecting yourself and your family, make sure to take care of your pets. If your pet remains with you, bring enough food to last through the emergency and remember any pet medications as well. If you need a safe place for your pet, contact the Virginia State Animal Response Team. Additionally, both the Red Cross and the ASPCA has great disaster preparedness information for pets. Before the hurricane hits ask any elderly neighbors you’re close to if they need assistance. Hurricanes and other disasters strike fast and often times, older residents aren’t prepared or physically can’t prep adequately. For tips on helping senior citizens, visit the Red Cross. Information is power during a disaster. In addition to utilizing the Red Cross website, download some of the Red Cross Emergency Apps on your iPhone or android smartphone. Remember to bring your phone charger with you if you have to evacuate. Relocate your family to higher ground. An attic or top floor of your home is much safer during a flood. If you become stranded on the road, seek higher ground on top of your car but be prepared to abandon it as well if water currents begin to move your vehicle. Only 12-18 inches of water can move a car. Stay updated on the storm, even if the power goes out. This may mean investing in a battery-powered radio or television. Also, download the Red Cross app. Let family members and friends know that you are safe by registering online at Safe and Well. Call 911 if you need immediate emergency help or contact the Virginia Department of Emergency Management at (804) 897-6500 for general information. 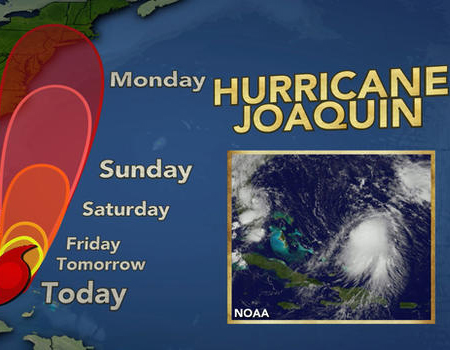 Go to an American Red Cross Reception Center or Shelter if you’re displaced due to Hurricane Joaquin or if you’re evacuating and need a safe place to stay. Drive. If possible, avoid driving altogether. This is because when a flash flood strikes it happens fairly fast, resulting in roadways becoming unsafe and completely submerged in unsanitary flood water. Forget to communicate with friends, family, and neighbors during a disaster. Also, call your employer if heavy rain or flooding causes roadways to close. Panic, especially if you’re a parent. If you’re experiencing a true emergency call 911. Experiencing a severe weather event like a hurricane is a traumatic experience but sometimes, the aftermath is just as stressful. After a storm and specifically a flood the focus shifts to recovery and restoration efforts, which 911 Restoration of Virginia Beach can help with. Along with heavy rain causing roof leaks, the biggest concern with weather like Hurricane Joaquin is flooding. Floods can come from a wide range of sources including pipe bursts and sewer system drainage issues, as well as local rivers or roadways overflowing. Once a bacteria or fungus infestation develops, mold inspection and remediation by certified professionals will need to take place as soon as possible in order to mitigate the mold damage. Let 911 Restoration of Virginia Beach be the calm after the storm. For a fresh start in your home or business, give one of our flood experts a call at (757) 324-5276 today.